The scheme will apparently allow Sony to improve its online services. Sony has joined the likes of EA and THQ by adopting an online pass scheme for its games. The scheme, called "PSN Pass," which use unique codes that grants full access to a game's online capabilities. The pass will debut with Insomniac's Resistance 3. Ostensibly, the PSN Pass is about improving Sony's online offerings. In a statement, Sony said that the move was part of an initiative that would allow it to "accelerate [its] commitment to enhancing premium online services across our first party game portfolio." What seems much more likely however, is that Sony is trying to encourage people to buy new copies of its games, rather than oick them up used. While the statement doesn't specify what will happen with pre-owned copies, presumably, consumers will be required to pay a small fee to gain access to the content, as is the case with similar schemes from other publishers. It's not a mystery as to why publishers want people to buy new copies - they make more money that way - and giving people reasons to want to buy new makes a lot of sense. What's sad is just how many publishers take this idea and use it as a stick to threaten consumers with, rather than a carrot to encourage them. Sony might make the argument that the multiplayer mode in Resistance 3 is a service as much as a feature, but that seems disingenuous, especially when you consider the importance placed on multiplayer in the FPS genre today. 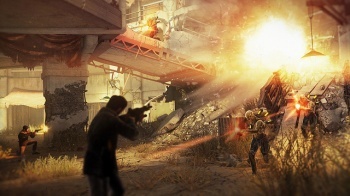 Resistance 3, and the PSN Pass along with it, come out for PS3 on September 6th.